6 Otter Lane is in the perfect location to park your car for your entire stay. 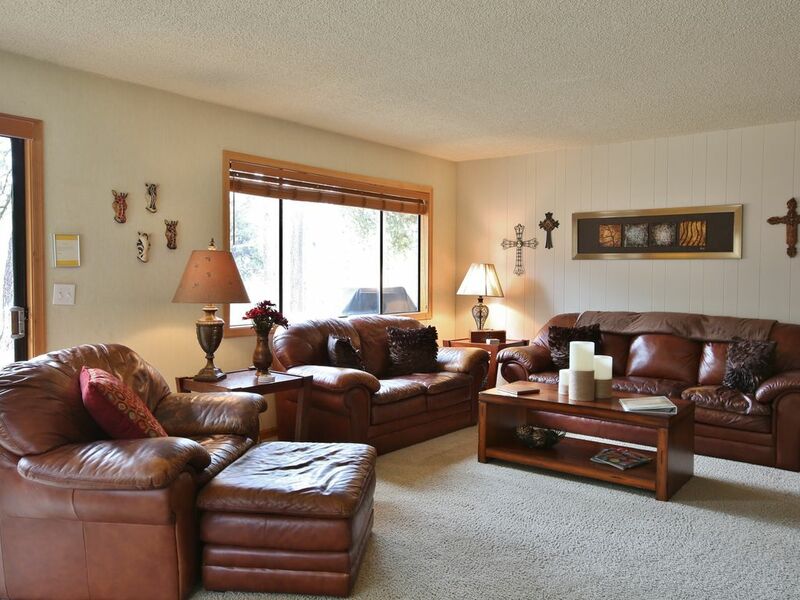 Our 3 bedroom, 2 bath home is located just across the street from SHARC and a 4 minute walk to the Sunriver Village. There are unlimited-use SHARC passes for 8 guests included with the rental of the home. The back yard is a grassy lawn and low open deck for relaxation and play. Amazing! Perfect location, close to everything. Such a cozy home. Our experience was amazing! This home had everything included. From hair dryers to laundry detergent to plastic bags. Things you forget to pack, they provided! The close walk to the sharc and the village was so nice! Perfect location and such a cozy and cute home. We loved the fact its on a caul de sac too. The kids loved the hottub as well. We definitely will be back! Absolutely loved the location for our first Sunriver visit. The house was the perfect size for our family of 2 kids, parents and grandparents. The property managers were very responsive when we had questions. There were a lot of bikes and they were in good condition. The house itself could use some maintenance. The back screen door was stuck and we never were able to open it. Some of the outlets were so loose that the plugs didn't charge. Our biggest complaint was the A/C - we visited in the middle of July and although the A/C seemed to be running non-stop, the house was much warmer than was comfortable. The only way to cool it off was to open the few windows with screens at night. Great family vacation place. Would definitely stay here again. Very clean. Enough room for the seven of us. Very close to everything. Bikes were in great shape. Had ALL the amenities we needed and then some. Super location, hot tub, bikes. Good value and size. We are happy to hear you enjoyed the location and amenities. Your feedback is appreciated! Hope to see you again! The house was perfect for us during our spring break. Plenty of space for our family of 5. The hot tub came in handy after our trips to Mt. Bachelor.